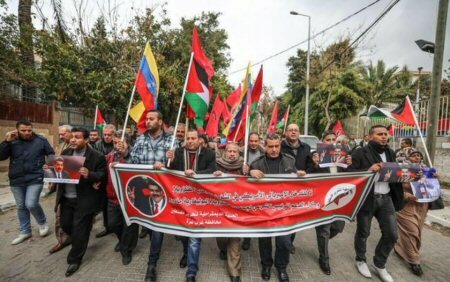 The Democratic Front for the Liberation of Palestine (DFLP) organized a rally in Gaza City, on Monday, January 28, to show solidarity and support for the Venezuelan president Nicolas Maduro, who is facing a coup to unseat him from power. A US-backed move has declared opposition leader Juan Guaido as the country’s acting president. The U.S. administration also announced sanctions against the state’s dominant energy firm PDVSA, on Monday. The Islamic Resistance Movement, Hamas, also denounced the United States’ foreign interference in Venezuela’s internal affairs, emphasizing that US policies of aggression toward the free choices of nations endanger international peace and security. DFLP member Talal Abu Zarifa said, according to Days of Palestine: “We declare our full solidarity with Venezuela and its government under the leadership of the democratically elected Maduro. Venezuela has been known for its longstanding and unconditional support of the Palestinian people against the Israeli occupation and oppression.